I have thousands of photos, hours of interviews with fantastic people UpTrees and my diaries from the year of climbing AND, I also want to populate the 200 colour page art book with graphical / illustrated images of trees from you! The work of Anna Widen. Artist and co-climber in tree number 268 with Hege Rimestad. – What you get? 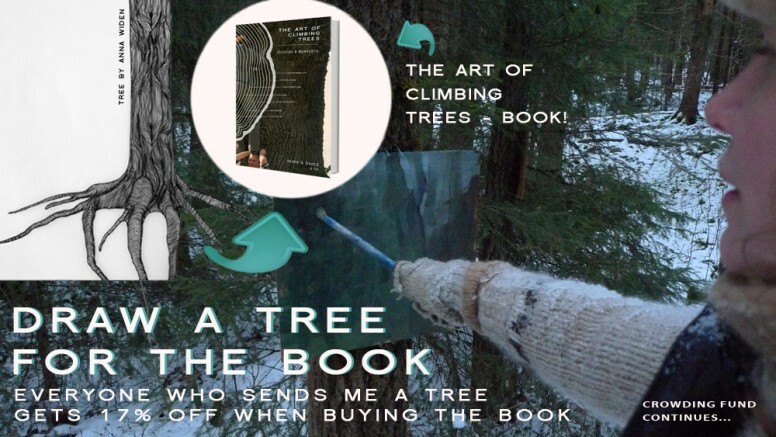 Anyone who sends me a tree gets 16.5% off the price of the book and you may get it printed in The Art of Climbing Trees. (When you then buy a book here – quote the name of your image in the message to seller box). – Your tree can be black and white or colour but I’m more likely to use images that can be laid on top of my photos or combined with the text. The more graphical the better. See the tree drawings I love by forest artist Anna Widen. – Please send files with 300 DPI in Jpeg or Tiff format. – New deadline – ongoing. Will let you know it’s too late! – Please share this call out for trees with your artist / illustrator friends, children, grandparents, twitter, facebook…etc! By sending me your tree you agree to its use in the book and that I can alter, crop it…etc. to fit with the book’s design. (I will be respectful). I may not be able to use all the drawings sent in but I will let you know! Thank you! Some of the trees I’ve already been sent! Next Manifesto part 2. The elephant. Hey! Where did you get the bright idea of printing your experience with trees on Paper? When during your 365 days with trees, did you have this epiphany? or just a PDF download… then people can be involved in the awareness of deforestation. Not be involved in Deforestation or the highly energy consumptive Recycling industry. Such a hard choice to make! It’s conciderably more environmentally friendly than regular paper. The Step forward paper does contain 20% tree pulp at the moment. I want to create a book so when there’s a collapse of ‘civilisation’ – my book will still be readable. You also have to take into account the environmental impact of ebooks. There is infrastructure and pollution that goes hand in hand with any digital medium too.